The Big Game. The Big Fight. 1,2,3... GameTime! 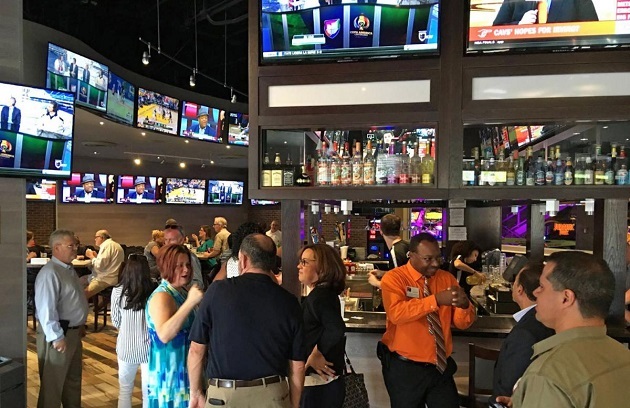 With Groundhog Day approaching and the holiday season a distant memory, let's leap into the month of February, where GameTime - Florida's best hot spot - becomes the place to be for Superbowl LIII and UFC 234! Join Gametime on Sunday, February 3rd, for what is sure to be a night of fun and laughs, as the best of the NFL collide in Superbowl LIII! Here's a disclaimer: All they ask is for customers to preserve their voices and get enough sleep the night before because on game day, prepare to bring that stored energy over to GameTime, where you'll be rooting your favorite team on, enjoying the company of passionate fans and customers alike, and most importantly getting hungry with all that activity! But no sweat, Gametime has you covered! Their delicious menu is second to none and on Superbowl Sunday, customers electing to dine-in will receive a special Superbowl promotion of 5¢ wings AND $5 25oz Sam Adams beer! Does it get any better than wings, beer and football?! Probably not. But at GameTime, they're constantly looking to make a lasting impression on their customers. In addition to their distinct menu and specialized promo for the evening, GameTime's five locations offer a mega arcade with 100 interactive games to tickle your fancy and get this, 60 state-of-the-art HDTV's to witness the big game. And just when you thought that was all, guess what? we're JUST getting started! On Saturday, February 9th, GameTime becomes your one-stop home for UFC 234! Get ready for another enjoyable night of action, as four of UFC's best middleweights clash in two separate bouts in what will surely be a night to remember. Prelims begin at 8 pm; be sure to arrive early (in fairness to our customers, GameTime implements a first come, first serve basis; no cover charges or reservations needed. Please be advised, those arriving in larger groups should all arrive together in order to be seated). Don't find yourself stuck at home, heating up leftovers, channel surfing, when you could be enjoying drinks, great food and did we forget to mention our 60 HDTV's? GameTime is fun for all ages and a great place to host your Big Game/Big Fight watch party. Where else would you rather be?! Make sure to visit GAMETIME for more details on these exciting events.